The Oxford Union has invited radical Islamist preacher Anjem Choudary to debate the origins of extremist thought in the UK, despite his recent arrest on suspicion of being a member of a proscribed terror organization. Choudary has links to many others charged with terror offenses in the UK. He is believed to have been part of the process by which Brusthom Ziamamni, the man found guilty of plotting to behead a British soldier, was radicalized. He was also an associate of a British man who mocked British security services on social media about his escape to the Islamic State. 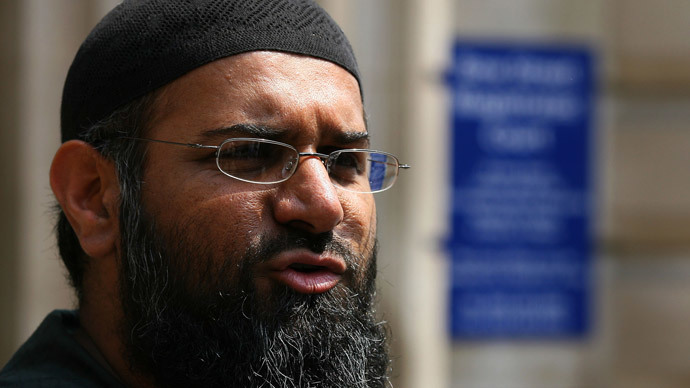 Choudary was arrested in September 2014 with eight other men, all charged with being members or supporters of banned terrorist group, Al-Muhajiroun. He is currently on bail. On Monday, the radical cleric spoke outside the Houses of Parliament boasting about his invitation to the prestigious university. He also railed against Home Secretary Theresa May’s counter-terrorism policies. “I am still on police bail after being arrested by Scotland Yard in September last year,” he said. Choudary once headed the recently proscribed radical Islamic Al-Muhajiroun group, which was founded 20 years ago. He is considered a key Islamist recruiter. He has been careful, however, to keep his speeches on the right side of Britain’s hate laws. Choudary has previously said if he is jailed, he will use his time in prison to spread radical ideas. Speaking outside Westminster on Monday, the cleric said he would prefer to be allowed to travel and live in Syria if the government returned his passport. “I believe people should be allowed to travel where they want to and go to ISIS-controlled territory to live under Sharia law,” he said. “In Britain, women who don't have their basic needs fulfilled are having to prostitute themselves. Elderly people are having to choose between food and heating their houses. In ISIS territories they are given food and water and have gas,” he said. He also said he believed Sharia law would soon be a part of the UK’s legal system. “There is nothing anyone can do to prevent it,” Choudary said. The Oxford Union declined to comment on its invitation to Choudary.